I love shrimp and have noticed that readers do too. However, in years past it’s not been easy to find sustainably produced shrimp. Old school fisheries involve dragging a net along the bottom of the ocean, with a huge amount of bycatch: about 4 lbs. for every 1 lb. of shrimp caught. Many shrimp farms are open to the ocean, leaching antibiotics, commercial fish food, and shrimp waste into the environment. Some shrimp farmers destroy native mangrove ecosystems to build farms. Luckily, the Monterey Bay Aquarium publishes sustainable shrimp guidelines, and they are getting easier to follow. Trending now are hook-and-line caught shrimp and closed-system farms. The rebuilding of the US Gulf of Mexico fisheries after Hurricane Katrina and the pioneering of closed-system farming enterprises in Thailand and Vietnam are both great news for shrimp eaters. And if I’m reading the guidelines right, we can now buy sustainable shrimp at Costco for under $10 per pound. 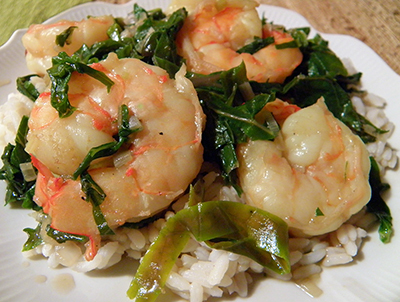 US wild-caught white shrimp, though not a best choice, is considered a good alternative. Costco is selling this fresh (not frozen) right now. The shrimp are large, which makes sense since they are caught by hook. Of course, there are environmental costs to transporting the shrimp across the US, in terms of greenhouse gas production. Continuing to eat shrimp sparingly if you’re not near the Gulf or south Atlantic is still best practice. 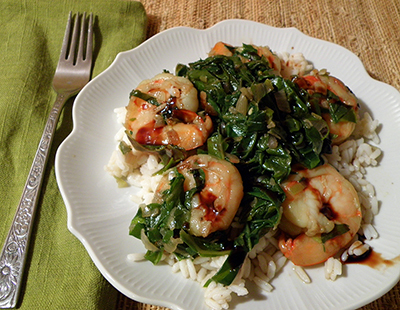 But I digress, because originally I was looking for a new recipe for kale, not shrimp, when I was once again inspired by Recipes from the Root Cellar. A most amazing crop, kale is available in Santa Cruz year-round, and in many varieties. And with our extra-warm spring weather this year our CSA is providing large amounts of it. Great for health, because according to WebMD, eating kale on a regular basis may provide significant health benefits including and cancer protection and lowered cholesterol. I’ve used a bunch of large Red Russian kale, though Recipes from the Root Cellar author Andrea Chesman prefers Lacinato kale (AKA Dinosaur kale), which requires less cooking. I’ve adjusted the recipe accordingly. If you’re using more delicate kale, consider cutting it into thinner strips and add it along with the shrimp, like Andrea does. I’ve added some extra shallots, because I had them on hand from last fall, and used the green garlic we’ve been receiving in our CSA share every week. You could substitute any kind of finely chopped onion, and use 4 regular garlic cloves, minced, in place of the green garlic. I upped the quantity of shrimp, since Costco sells it in 2 lb. packages. Feel free to use the smaller (original) amount. A few word about balsamic, as this recipe calls for a high quality vinegar that is thick and sweet. The Modena (Italian) vinegars are excellent choices for Europeans, but sometimes quite expensive in the US. Trader Joe’s carries some inexpensive Modena balsamics, though I haven’t tried them yet. 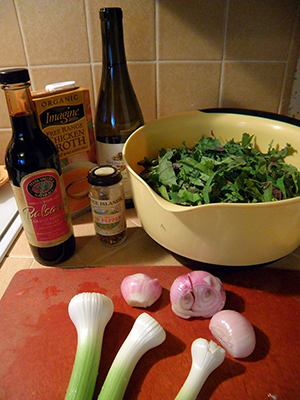 Napa Valley Naturals Grand Reserve is a thick, rich, and relatively inexpensive US-produced fancy balsamic. Please leave a comment if you have a favorite balsamic to recommend! Mince shallots and green garlic. You should have about ¾ cup of each. 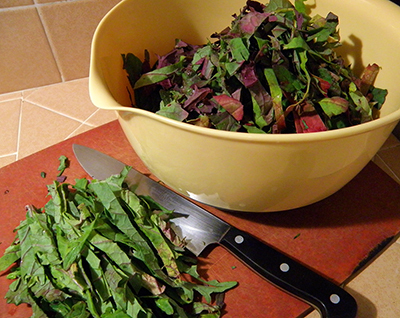 Wash kale and remove thick stems. Stack up leaves and cut into ½ inch or smaller strips. Douse with water and drain. You should have about 10 cups. Peel and devein/clean shrimp. Pat dry with towel. Heat oil in electric frying pan at 325 degrees (medium high). Add shallots, garlic, and red pepper flakes. Sauté until fragrant, stirring constantly, about 2 minutes. Add damp kale a handful or two at a time. Stir and sauté each handful until it begins to wilt, then add the next handful (unless you can fit all the kale into the frying pan at once). After about 4 minutes, all kale will be semi-wilted. Reduce heat to 275 degrees (medium), cover and steam until kale starts to get tender, about 5 minutes. Turn heat up to 325 degrees again. Add shrimp and sauté about 2 minutes, stirring constantly to partially cook the shrimp. 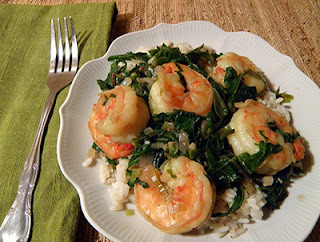 When all shrimp are partially opaque, stir in broth and wine. Cover and cook for another 2 minutes, then open lid and stir so that shrimp will cook evenly. 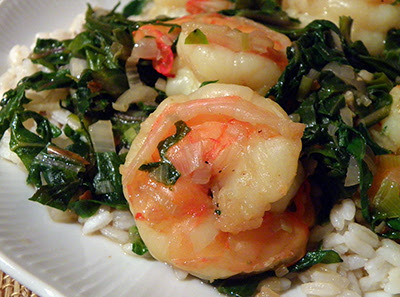 Cover and cook until shrimp are just opaque, another 1 – 3 minutes depending upon size of shrimp. Season with salt and pepper. Drizzle with 1 – 2 tbsp. vinegar, depending upon how much shrimp you used. Serve immediately over rice or with crusty bread. Drizzle a little extra vinegar over each serving, or let diners add their own. Shrimp is such a versatile product. You can have it by itself and it tastes good. It does not matter whether it is cooked, or uncooked in sushi, once it is fresh. The freshness, as with all seafood, helps to determine the flavor. I think combining this type of seafood with green vegetables is a good idea. It gives you the best of two worlds, when it comes to vitamins and other nutrients. Kale is a nice seasonal vegetable and people are always looking for new ways to cook it.